Abstract: Airwheel electric self-balancing scooter has considerably changed commuters’ daily lives, which adds convenience and intelligence to everyday transportation. Why can Airwheel do this? High technology is the key to all the innovation and design, which brings Airwheel such outstanding features. 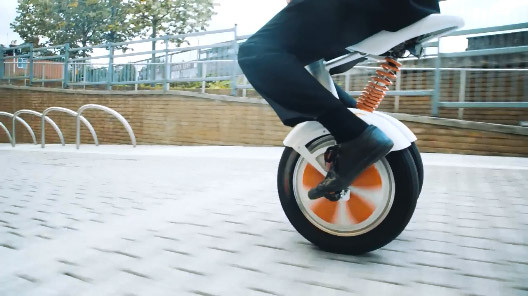 Airwheel electric self-balancing unicycle, replacing bus and subway, reshapes commuters’ daily lives. All the innovative features, which bring convenience and intelligence to the scooter lovers, come from the high technology. Every Airwheel intelligent scooter is outfitted with a special built-in Airwheel intelligent chip, which adopts the most advanced intelligent system, using aerospace attitude control theory, fuzzy software algorithm and gyroscope system to realize self-balance. High-tech intelligent chip provides speed limit protection, which controls the speed within a safety range in order to ensure users’ safety and prevent traffic accidents. Besides, the built-in chip makes the scooter react just as human beings and detects every physical movements, so the rider only needs to move forward or backward slightly to control Airwheel intelligent scooter. Therefore, high technology brings safety and convenience to the riders. 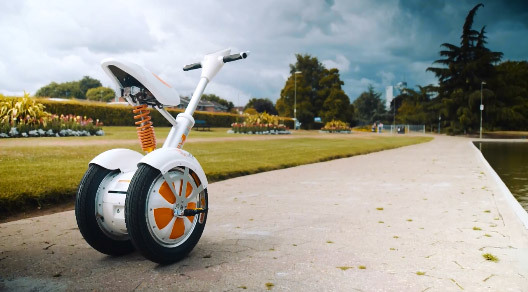 Airwheel sitting postrue self-balancing scooter is powered by an eco-friendly resource—electricity, which does little harm to the environment. Unlike the fuel, whose emission pollutes the air, electricity is a type of clean energy resource. Airwheel intelligent scooter is especially equipped with premium Sony battery, which has an outstanding battery performance and a long lifespan. The high-quality battery not only guarantees a smooth riding experience, but is also energy-saving. Riding Airwheel for one hundred miles only consumes one to two degree of electricity, which is green and environmentally friendly. Undeniably, high-tech innovations definitely play an important role in producing a better product. The original automatic steering-sensor system, the original hydraulic suspension, the electronic brake system all makes Airwheel a more excellent brand. Another shiny point of Airwheel intelligent scooter must be the A3 and its sitting-posture model. The release of A3 perfectly changes the stereotype of intelligent scooters and makes possible the long-distance traveling, which attracts a large number of customers. Riders now could comfortably sit on the leather sadder, laying their feet on the stainless steel pedals and hands on the silica gel handlebars. Airwheel and high technology cant drift apart. With high technology, Airwheel will be a more customer-oriented, intelligent and eco-friendly product.